Colombia's Farc rebels have said they are going to release six people being held as hostages in jungle camps in the next few days, local media say. The two politicians and four security officers have been held by the leftist group for several years. 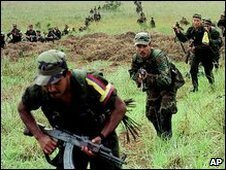 A Farc statement said the captives would be handed over to a left-wing Colombian senator, reported Reuters. The Farc is still holding hundreds of hostages, either for ransom or to exchange for government-held rebels. The statement gave no date for the release but said it would be "soon", the Associated Press news agency reported. The text said the release was a gesture aimed at initiating a prisoner exchange with the government. Three police officers and a soldier would be freed first, followed by an ex-governor and a former congressman, the statement said. In October, ex-Congressman Oscar Tulio Lizcano managed to escape after eight years in captivity. And in July, 15 hostages, including former Colombian presidential candidate Ingrid Betancourt, were freed in a military operation. Ten of thousands of Colombians have taken part in protests demanding the release of those still held by the Farc (Revolutionary Armed Forces of Colombia). The group has fought to overthrow the Colombian government and install a Marxist government since the 1960s. In the 1990s it turned to the drug trade to raise money for its struggle and has suffered a series of defeats in recent years, including a number of defections and the Betancourt rescue.